Fife has a long history of whisky but in recent times it has been a fairly desolate outpost with only a certain grain distillery flying the flag. There is of course the wonderful Daftmill distillery that does things by its own rules and in its own time. A thoroughly recommended experience and a lovely whisky that we are kept waiting to experience, which you can read about here. Perhaps maybe sometime in 2015 Francis? Now all of a sudden we have the long awaited Kingsbarns Distillery due to start production in January 2015. I'll be visiting that distillery once production commences and taking the tour. 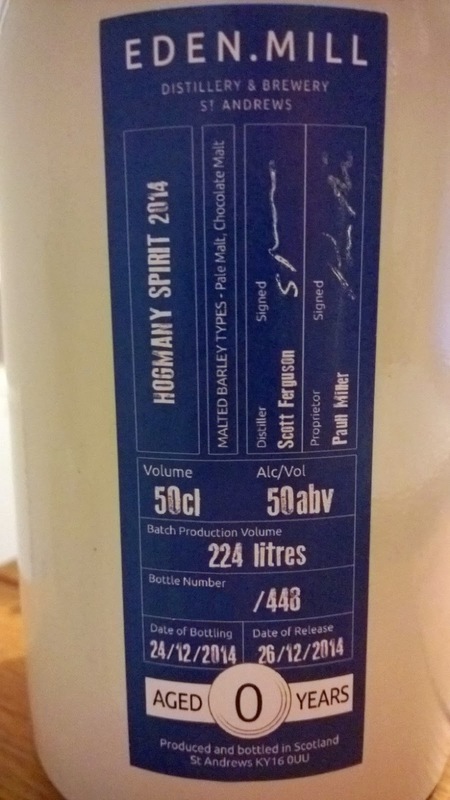 For now though we have the first new make spirit from Eden Mill, who are combining whisky with gin and beer. A UK first on one site following the very successful examples we've seen in America. I've been impressed by what this brewery just outside of St Andrews has offered in recent years with its range of small batch beers and took the tour in March 2014 here. This area of Fife has a long association with the Haig family and their origins in whisky production. Unfortunately say Haig to anyone nowadays and they'll think of the awful Beckham fronted Haig Club grain drivel. With production starting in November 2014, this is a small scale artisan distillery that will fill 8 casks per week. Distilleries that face start-up costs and the long 3 year wait till bottling whisky have to pay the bills. Eden Mill has its brewery division to fall back on and I'm told by my other half that their gin is very good. In such situations distilleries often come up with cask ownership initiatives or for instance the Lakes Distillery offered the option to receive a bottle from each year of production for a set period. 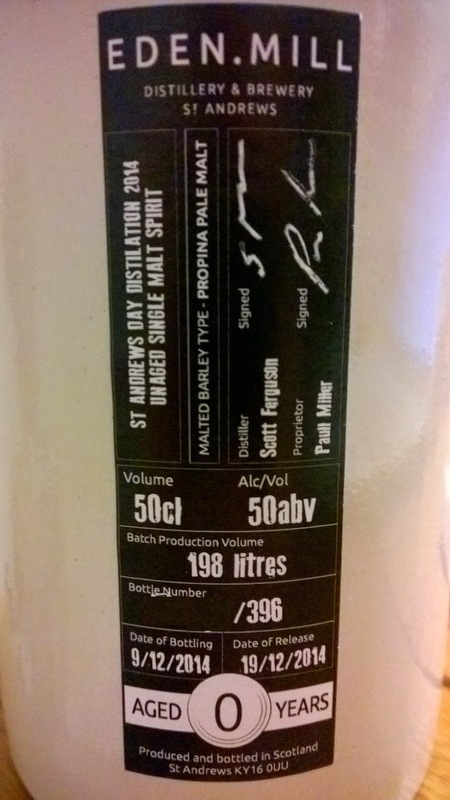 Eden Mill has decided to bottle 3 spirit releases in editions of just 320 bottles for each run. These will consist of the St Andrews Day release, a Hogmanay release (spelt Hogmany on the label!) that features chocolate malt and the forthcoming Robert Burns Day. 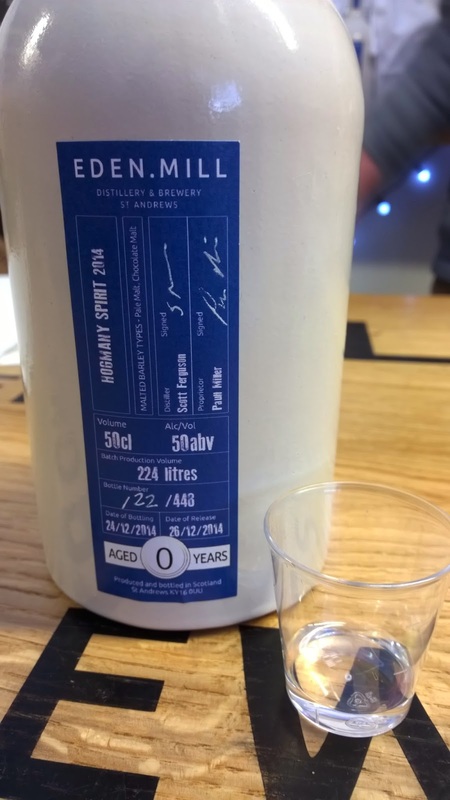 Priced at a reasonable £35 (brewery membership reduces this by 10%), this buys you a 50cl ceramic bottle that matches their special gin editions. I quite like the presentation and the bottle seal seems very efficient unlike those Bells decanters that dry up very easily. The whole thing is wrapped up in a linen sack cloth complete with Eden Mill branding. By owning a bottle this will guarantee the right to purchase a bottle of each subsequent release in the series. So if you own the St Andrews Day then you can purchase this at 1 year, 2 year and have the option to purchase the whisky at 3 years old. This journey through time is enticing and with only 320 bottle tickets they'll soon be snapped up. If that wasn't enough then bottle ownership grants you an annual invite to a VIP tutored tour of the distillery with a couple of unique drams at the end of it. Over the years I've tasted new make spirits and young whiskies that could strip a garden fence with a quick spray. Thankfully the Hogmanay (or is that Hogmany?) spirit was clean, light, fresh, sugar coated and delicate very much like a fruity Speyside Craigellachie or Glenlossie. It shows promise from an early distillation, as Eden Mill try various mashes before settling on their unique style. I also appreciate is how open the team are with their plans and what barley has gone into each release. The information pack insert highlights the artisan craft nature of the distillery with humans rather than machines in control of the spirit; deciding exactly to cut the spirit on taste and skill rather than machines and 'accountants yield targets'. I'm very impressed by this, as computerised Scotch is a terrible creation of chemists and accountants in the pursuit of profit and efficiencies. Somewhere along the line we've lost the truly unique skill of creating a fine spirit. For now I'll leave you with the details of both of the initial 2 new make spirit releases. I kinda enjoy the 'aged 0 years' statement on the ceramic bottle; at least they ain't hiding anything. I'll complete the hat-trick with the Burns Spirit next month and then will come the wait as Eden counts down the years till it can bottle its first whisky. For more information on Eden Mill then head over to their official site here.